Apple on Saturday announced that its iOS App Store for the iPhone, iPod touch and iPad has reached the milestone of 10 billion downloads since its launch in 2008. "Thank you. Ten billion times," Apple's official countdown was changed to read. 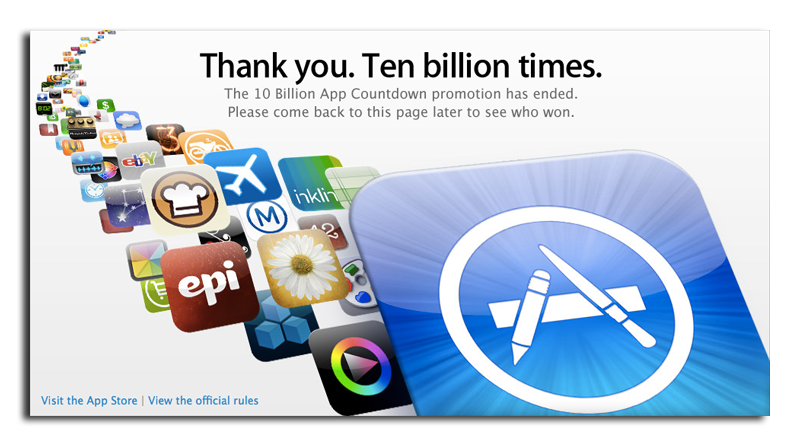 "The 10 Billion App Countdown promotion has ended. Please come back to this page later to see who won." The company began a countdown to 10 billion downloads on Jan. 14, when there were about 250 million downloads to go. It ran a promotion in which the 10 billionth downloader will win an iTunes gift card valued at $10,000 U.S.
Downloads from the App Store have grown at an exponential rate. It was in January of 2010 that Apple announced total App Store downloads had topped 3 billion in the digital download destination's first year and a half. But in the last year, the number of App Store downloads has more than tripled, with nearly 7 billion downloads in the last year alone. For comparison, in its first year, the App Store reached 1.5 billion downloads. There are more than 300,000 applications available on the App Store for the iPhone, iPad and iPod touch. And Apple revealed this week that it has sold 160 million iOS devices. The App Store originally debuted on the iPhone and iPod touch, but last year it was extended to the iPad. In addition, this month Apple launched a spin-off of its popular iOS downloading service for the Mac, dubbed the Mac App Store.